Computer scientists at the San Diego Supercomputer Center and the Cooperative Association for Internet Data Analysis (CAIDA) at the University of California, San Diego, in a collaboration with researchers at Universitat de Barcelona in Spain and the University of Cyprus, have created the first geometric"atlas" of the Internet as part of a project to prevent our most ubiquitous form of communication from collapsing within the next decade or so. In their paper Sustaining the Internet with Hyperbolic Mapping, the researchers say such a map would lead to a more robust Internet routing architecture because it simplifies path-finding throughout the network. "We compare routing in the Internet today to using a hypothetical road atlas, which is really just a long encoded list of road intersections and connections that would require drivers to pore through each line to plot a course to their destination without using any geographical, or geometrical, information which helps us navigate through the space in real life," said Krioukov, principal investigator of the project. Now imagine that a road -- or in the case of the Internet, a connection -- is closed for some reason and there is no geographical atlas to plot a new course, just a long list of connections that need to be updated. 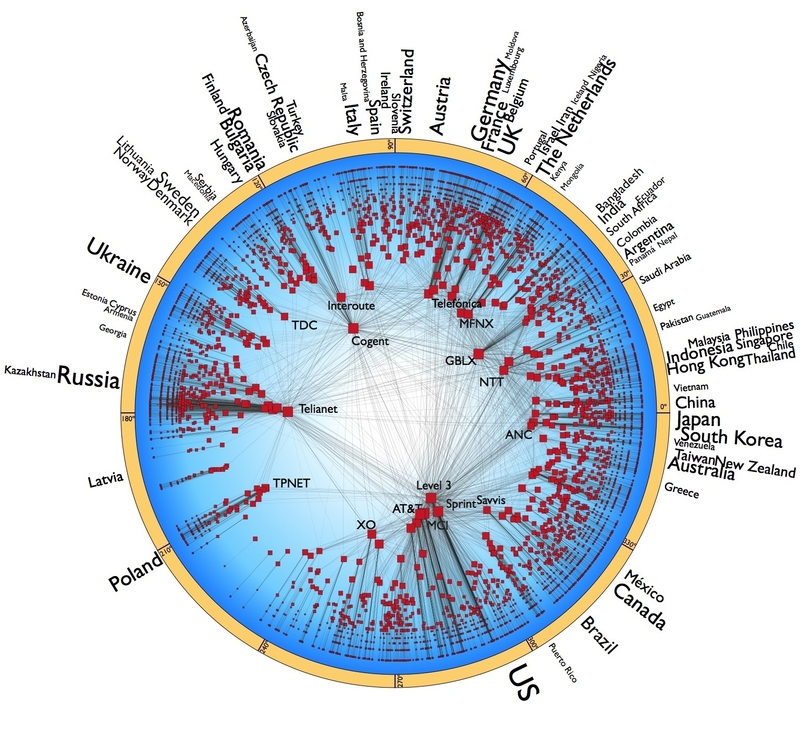 "That is basically how routing in the Internet works today -- it is based on a topographical map that does not take into account any geometric coordinates in any space," said Krioukov, who with his colleagues at CAIDA have been managing a project called Archipelago, or Ark, that constantly monitors the topology of the Internet, or the structure of its interconnections. Like many experts, however, Krioukov is concerned that existing Internet routing, which relies on only this topological information, is not really sustainable. "It is very complicated, inefficient, and difficult to scale to the rapidly growing size of the Internet, which is now accessed by more than a billion people each day. In fact, we are already seeing parts of the Internet become intermittently unreachable, sinking into so-called black holes, which is a clear sign of instability." In their paper, the researchers employ Ark's data and statistical inference methods to build a geometric map of the Internet. They show that routing using such a map would be superior to the existing routing, which is based on pure topology. Instead of perpetually accessing and rebuilding a reference list of all available network paths, each router in the Internet would know only its hyperbolic coordinates and the coordinates of its neighbors so it could route in the right direction, only relaying the information to its closest neighbor in that direction, according to the researchers. Known as "greedy routing", this process would dramatically increase the overall efficiency and scalability of the Internet. "We believe that using such a routing architecture based on hyperbolic geometry will create the best possible levels of efficiency in terms of speed, accuracy, and resistance to damage," said Krioukov. However the researchers caution that actually implementing and deploying such a routing structure in the Internet might be as challenging, if not more challenging, than discovering its hidden space. "There are many technical and non-technical issues to be resolved before the Internet map that we found would be the map that the Internet uses," said Krioukov.